Whats hot and whats NOT.. A comprehensive fishing seasons calendar year guide through the turns and cycles of the fishing year here in Key West, Florida. Written by Capt. Steven Lamp Veteran Key West fishing guide, photographer and director at Dream Catcher Charters. Getting the most out of your Key West fishing vacation takes good planning. We hope this calendar of species availability will help you do just that. If you have any questions about the time you will be here, Feel free to give us a call. We will help guide you to the best fishing experience possible. Or email us at info@dreamcatchercharters.com we will get right back with you. Many folks think that Key West is lacking seasons. While compared to many other areas of North America that may be true, but not so much as you might think. Water temps in the Key West area stay pretty steady near the deep waters of the Gulf Stream. Inland however that can be a different story. I have seen certain flats throughout the year range in temps from 62 - 89 degrees. Thats a pretty broad range. With the constantly sweeping tides here in Key West that bring water back and forth from the Atlantic Ocean to the Gulf of Mexico along with atmospheric condition changes creates our seasonal differences. There really is no "line in the sand" effect to our seasons in Key West fishing. Just a guideline of usuals and seasonal changes that will affect what we know of the fishing. To a fishing guide these seasonal effects dictate more to what species he will be targeting, than a difference of weather. Since we fish year round here. Our winter months are about the most dramatic in the way of temperatures and probably the most obvious day to day fishery change due to the weather. One day it can be blowing from the north and the winter species will prevail both inshore and offshore. Then a wind switch is all it takes to usher in some warm moist air from the south and all of a sudden you think its October and summer species are here and chewing. The main thing folks like to fish for is the beginning of our sailfish run. Sailfish from 30-70 lbs are coming down the reef line when conditions are right. Balckfin tunas and the mackerel are a big part of winter deep sea fishing. Our King Mackerel (kingfish) range from 10 - 60 lbs. We also have an abundance of cero mackerel approaching world record sizes on the cooler days. Catch a southerly breeze and the dolphin (mahi mahi) will show up and there are always good amounts of bonito and barracudas to fill in the gaps. We think the winter is the best time for meat hunters for Yellowtail snappers, mutton snappers and grouper making up the list mixed with the mackerels such as cero and king eating the massive amounts of bait attracted to the reef and wrecks. Grouper season closes in the Atlantic on January 1 every year so we hope to get the cooler waters here in December to make good on the last part of season. A great way to catch a nice dinner and not kill the bank. On the wrecks in the cooler months like January and February we look for Cobia. Winter can be windy. But it can also be warm and humid on some of the days which really turns on the Key West flats fishing. Permit don't seem to care much about cooler water temps and can always be spotted by the patient angler. January and February being better months for sight fishing for large permit on the flats. Large barracudas sun themselves on the flats and will eat a bait presented well. Cobia will tail the rays and sharks cruising the flats in the cooler water temps. Jack crevales are a fun way to break up the day on the flats as they chase the rays in the shallows. redfish are also a fun species to target but can be very specific to tides. We call the redfish the winter time bonefish. 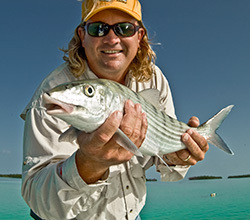 Speaking of which, bonefish, while still around, are not a focused target in the winter while flats fishing. We fish the flats on our flats boats and bay boats in the winter based on our clients needs and desires. Both light tackle spin fishing and fly fishing techniques are used here. In the winter backcountry fishing charters make up a large portion of our trips here in Key West. With the promise of calmer waters even on windier days and lots of action throughout a fishing trip makes it a great way to go. We have an amazing speckled sea trout fishery here in Key West. With the sea trout runs jack crevales, blue fish, pompano, snappers, ladyfish and sharks. Its not uncommon for an angler to catch 40 to 50 fish in a half day charter with over 10 different species. With our bay boats we can handle up to four anglers for a fun day of backcountry fishing. We really enjoy fishing the Marquesas Keys providing the weather is not too crazy in the winter. Working all around the islands for shots at a larger number of species on many different types of tackle. We call this trip the "All In Wonder". Great for 3 anglers or less, but we can take up to 4. Fishing the flats, the shallow wrecks and reefs surrounding the Marquesas makes for a super fun day with winter time shots at: Permit on the flats and shallow wrecks, big barracudas sunning themselves on the flats, large jacks cruising with the rays, sharks, tarpon on the warmer days, grouper and snapper on the reefs using light tackle and lot of other really fun fish. 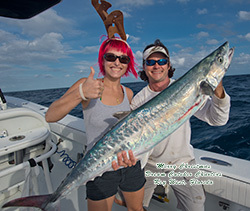 Check out the "All In Wonder" fishing charter to learn more. Spring time is a great time and the most popular (most people come here) time to fish here in Key West both inshore and deep sea. We have a huge cast of characters (fish species) ready to eat and entertain. The end of winter is ushered out by warm fronts and more tropical breezes. Tourists are visiting Key West in the droves with spring breakers stating late February going into March and families follow them. Spring is the time for our sport fishing. The tarpon fishing heats up as the migration happens inshore and the sailfish push through offshore with the biggest dolphin we will see all year. People ask us all the time " when is the best time to go fishing in Key West"? Spring time is my cookie cut answer. The flats are coming alive in the spring with the warmer water temps. Permit fishing is really strong in March just before these world class sport fish head out to the wrecks and reefs for a migration break in April right around the moon. Mid April some bonefish start to show up in their haunts and get pretty consistent by May and June, albeit not very large. 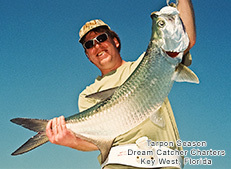 The migration for tarpon fishing starts in May. Where a huge slew of tarpon come to Key West making themselves available to flats fishermen in less than 3 ft of water. This is a very busy time for all of us flats fishing guides as the tarpon migration has become very popular. Book your dates early. As June matures the flats fishing gets EPIC, but the temps also get pretty warm. Flats fishing in June has lots of shots at Migrating tarpon, permit and bonefish tailing on the flats, Its what I call the beginning of SLAM season where feasibly a guy could catch all three in a single fishing charter. In March our Key West tarpon fishing season starts for us as backcountry fishing guides. For the exception of the stray late cold front that may slow things a bit the tarpon are here, they are big and they eat really well. We use Live bait, chumming techniques and some artificial lures to catch tarpon in March. Our backcountry fishing charters often fish the shallows of the flats and we always take advantage of a good tide to fish for permit on the flats. When the permit head out to the reef and wrecks to spawn our backcountry bay boats are super versatile and can head out there after them as well in April. Shark fishing in the spring is really good. The bull sharks and lemon sharks are spawning on the flats and shallows furring March and April. Its not uncommon to see HUGE sharks just moving along slowly in less than 4 ft of water. The All In Wonder fishing charter is a great way to experience as much as possible in a day of fishing during the spring. The reef fishing seems to even get better in the spring. There are so many fish in the shallows looking for food and warm water it makes putting together a nice table fare of fillets pretty easy. Grouper season opens back up in May for the Atlantic and muttons snappers, mangrove snappers and grouper are all fun to catch. Also the month of April sends most of the permit out to the reef to spawn. We are talking Thousands of fish in one or two spots along the reef line. On the full moon of May and June the mutton snappers and spawn on the reef. Many anglers book way in advance to take advantage of these opportunities with their favorite fishing guides. As a charter company we do not fish the spawns for a few reasons, feel free to drop an email to us and ask why. Now we are talking. Big Dolphin start showing up in Early March on our Southeasterly flowing winds and ripping current in the Gulf Stream, but the BIG story is the sailfishing. In the heat of sailfish season 20 - 30 eats or hook ups is not uncommon here off of Key West. The gamble is, whens that going to happen? Good news, we always have pretty good sailfishing throughout the spring, mix that in with dolphin, wahoo, king mackerel and black fin tunas and you have a pretty awesome day of fishing. Typically the big push of sailfish happens late April to early May. Book Early. Just pick you day and get out there, anglers have fun. Our deep sea trips head out on many different types of boats ranging in size from 39 - 60 ft. See the Key West Deep Sea Fishing Fleet. Permit fishing on the flats can be done with a flats boat or bay boat. With spring tides and lots of fish moving around I prefer the Month of March for this. In April the permit move to the reefs and wrecks just offshore still in reach with the bay boat. Thats not to say that the permit are gone from the flats completely, there are still some fish around. Bonefish don't really start to show in the Marquesas till late May or June. The big interest in the Marquesas is tarpon. From March through the end of June into July tarpon fishing in the Marquesas is as good as it gets. Fly fishermen will enjoy the migration tarpon in May - June where the fish get into less than three feet of water and make for a nice shot. Just offshore we fish the reef with artificial lures and fun techniques that really keep things interesting. The All In Wonder Fishing Charter is a great way to incorporate the Marquesas Keys into your day on the water with us here at Dream Catcher Charters. Summer time here in Key West is story book conditions for flats fishing. Yes its warm but our anglers can expect to get in on some stellar tarpon fishing in the mornings followed by some great tailing conditions on the flats for bonefish and permit. Light tackle spin fishing or fly fishing your choice. Summer is a great time for flats fishing here in Key West. Anglers can chose to fish the flats u to 2 persons on our flats fishing skiff or use a bay boat for up to 4 persons to challenge themselves in the shallows. What a great way to spend a beautiful day on the water in our backcountry where the islands are vast and the waters are beautiful. We start all of our backcountry fishing trips in the summer off with a shot at tarpon fishing first thing, seems to be a crowd favorite on our bay boats. Once we get our fill and depending on how long the trips is scheduled for We head off to the flats for some sight fishing or casting plugs on the shallow reefs for some fun fighting reef fish. The shark fishing in the summer is also very good. Fishing deep sea in the summer is fun. Tasty too. Dolphin (mahi Mahi) are the hit of most days with an occasional wahoo or sailfish. Trolling is productive and fun especially when anglers run into large pockets of dolphin then it gets crazy and everyone dives into the fun of bailing fish like crazy. When choosing a deep sea fishing boat in the Summer Time we recommend that special consideration be taken for those that are sensitive to the heat. Some of our deep sea fishing boats have Air Conditioning to get out of the heat and some don't.. When calling to book a deep sea trip we will go over all the options with you to make sure you are on the right boat for your groups needs. 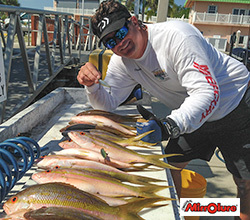 Fishing the reef in the summer anglers can expect great Yellowtail snapper, grouper and mutton snapper catches. There are a few ways to fish the reefs here out of Key West. Summertime offers the best weather for the long runs needed to head out toward the Dry Tortugas (Ft Jefferson) to some of the best reef fishing in the world. Without a doubt we run to the Marquesas Keys more than any other charter service in Key West. We love it out there and we know our clients do as well. June still holds many tarpon in the Marquesas and can still be a bit crowded but by late June into July the crowds thin and things get fun out there. 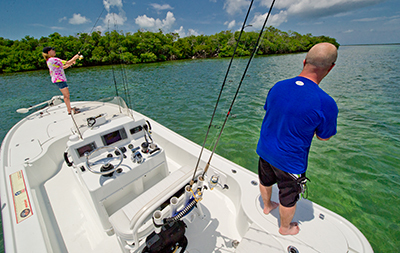 Our "All In Wonder" day of fishing includes Fishing The Marquesas Keys. This is a great opportunity to experience many different types of fishing in one day. July marks our Florida Keys lobster season. Lobsters are in the shallows and we go out to harvest them with our clients. The last week in July is the 2 day sportsman season and August 6th marks the beginning of commercial season. We do half day lobster diving trips with instruction and all the equipment needed. The fall here in Key West is a pleasant time to be here. Crowds start to thin out and the weather starts to get a little cooler. Room rates get more affordable during non festival weekends and the fishing starts to change in some areas, heat up in others. Without a doubt the best time of the year to go flats fishing here in Key West and all the Florida Keys for that matter. The SLAM season. The Key West grand slam consists of a tarpon, permit and bonefish all in one trip and no other time of the year is it easier to do this than the fall. We fish the flats on our flats boat for 2 or less and our bay boats with 1-4 persons. The choice is yours. Just as much as it is about the fishing, the backcountry is absolutely awesome in the fall. The colors, water clarity, peace and tranquility. The fall offers our transitional months in the backcountry fishing we get into many different species. Cooler weather is better, cold fronts bring cooler temps and great opportunities at some fun fish such as Trout, Jack Crevales, Sharks, Barracudas on the flats and permit. 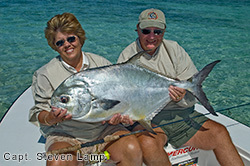 Late in the fall we also get into some great snapper and pompano fishing to really sweeten the pot. Many of our corporate group trips come here in the fall to fish the backcountry in our signature species hunt fishing tournament that we organize for them. The reef comes alive in late October through November especially if we get a cooling trend to set things up. Copious amounts of ballyhoo and other bait-fish start to stack up everywhere throughout the Key West area reefs. The Yellowtail snappers, mutton snappers and grouper love this and eat like pigs. Easy days to get out to the reef and enjoy some fun times catching tasty fish. 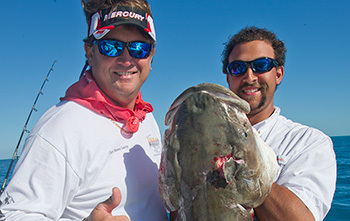 We offer a few different ways to fish the reefs depending on budget and timing. I cant say the Fall is my favorite time for deep sea fishing. The dolphin are really small or non to be found and until the first cool fronts things can be pretty slow out there in the blue water. In November we do get a nice push of sailfish and black fin tunas. The best thing to do here is wait till you are scheduled to come down and give us a call then to arrange your trip. We can better direct you then to say how good we think it may be out there based on the fishing trends. Also, its the slow season so we wont have any issues getting you in the books last minute.